Overall, this cabin was satisfactory. First the good.....Size of the cabin was good for our 2 families, and the views were great. It is close by to all that Pigeon Forge, Gatlinburg, and the surrounding area have to offer. 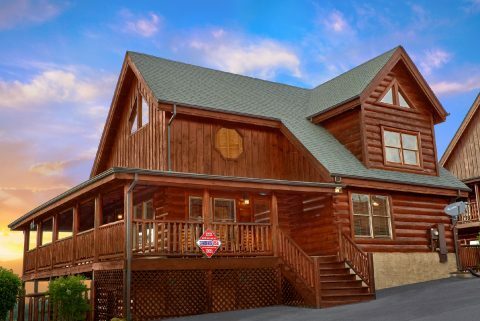 Yet, it has a nice country / mountain feel, as if you are not close to all of the hussle and bussle of nearby Pigeon Forge. Kitchen is adequately stocked (though it could use another hand towel or two), and the downstairs entertainment area kept the kids busy. Now the bad.....we experienced a decent size grease fire inside of the grill on our first use. It was apparent that it had not been cleaned for quite some time. We submitted a maintenance request, and someone came out later that day to clean the grill and drop off some new grill utensils. Hot tub was great for the first two days, but the water quickly developed and brown-ish appearance and a smell that left it un-useable the remainder of our stay (to be fair, we did not complain or request maintenance to address this issue). Climate control was also an issue within the cabin. Despite following all of the instructions left within the cabin (closing doors upstairs to control air flow), we were never able to control the temp to our liking. I don't believe the thermostats work, as we were never able to achieve the temp we set them at. Additionally, when we tried to cool the cabin down, we noticed that the outside AC unit was not kicking on. Fortunately, the outdoor temps were not too bad, and we were always able to crack a door open to get some fresh, cooler air in the cabin. The couch in the main living area is very uncomfortable. It appears that the cushions are in need of a major upgrade (or the whole couch should be replaced). The cushions appear to be at least half the thickness of the matching cushions on the love seat and chair. The upstairs bed is also very uncomfortable. The mattress appears to have high and low spots that cause the discomfort. We also found some stains on the sheets while getting into bed the first night. And finally, the garbage was not picked up from the cabin once in our 6 days spent there. The outdoor trash bin was quite full and we could not fit anymore in there by about the 4th day. At the end, we just had to place multiple bags of trash on the top of the bin. Nearly Rustic was a very nice and comfortable place to stay. Location was great. I highly recommend this cabin and will definitely stay there again. The cabin was very nice with plenty of space for our family of 8. We did have to call for service on the hot tub because it did not have chlorine tablets but they were there quickly and resolved the matter. Very happy with our stay and would recommend. The cabin was very cozy and pretty. The couch needs replaced; it’s wore out and not very comfortable. The rest of the cabin was fantastic. I would rent again because the price is very fair. The cabin was extremely cold when we arrived. The heat was not working. A service man was sent out, but the unit could not be fixed that night, so he kindly brought us heaters. However, when he left and we plugged them up, they tripped a breaker. It ended up we could only use one; therefore, the first night was very cold for those sleeping on the main floor and upstairs. The next day, a service man was able to fix it after a couple of hours. We had heat from then on. However, we feel this type of problem should have been detected before we arrived. Other than that, we enjoyed the cabin and felt those we dealt with were very friendly. We would use your service again. Everything was great, we loved the hot tub, pool table, and arcade game. We did find some trash throughout the cabin from previous stays, and two of the TVs did not work. We didn’t come there to watch tv, but it would have been nice if the direct tv would have worked at night in the bedrooms as we were going to sleep. We called management and it never got resolved. But all in all we really enjoyed our stay and would stay again.